The basis of this wonderful recipe is sweet potato, and we know that potatoes are great source of antioxidants, minerals and a lot of vitamins. This recipe is represented by nutritionist Laura Flores of San Diego. The sweet potato contains many vitamins such as B6, B5 and A, also contains thiamine and niacin. This vegetable contains more sugar than white potato, but on the other hand it is completely fat-free. It has super anti-inflammatory properties because of the color-pigmented vitamins that contains in itself. This type of potato can freely be consumed by people who have elevated sugar because it has properties toregulate the level of blood sugar. The next ingredient of this recipe is coconut flour. It helps regulate cholesterol in the blood, and ginger and turmeric are great for dealing with inflammation, virus prevention and reducing the risk of severe illness. Then, as a good source of healthy fatty acids, we use Coconut milk. This can help you to boost your metabolism and reduce the body weight. It is rich in vitamins B, C and E, iron, magnesium, selenium and phosphorus. You need to heat the oven at a temperature of 400 degrees. Then, on the sweet potato, make а several holes and put it to the oven, and bake about 60min. Once the potato is cool, peel off the skin and place it in a mixing bowl. In the same bowl, add maple syrup, coconut milk, olive oil and mix well. Mix the dry ingredients in a separate dish and then add them, stir until they are combined with the whole mixture. Then fill in the tiles in a muffin pan and bake for 30 to 35 minutes. 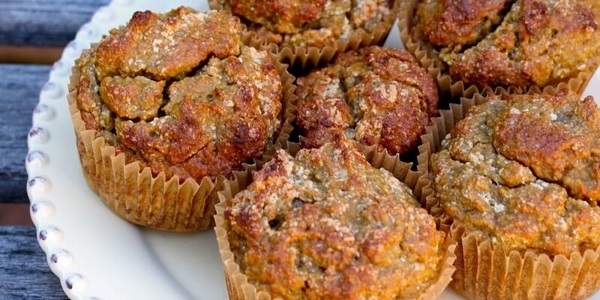 Enjoy the wonderful taste of these plant-based muffins.